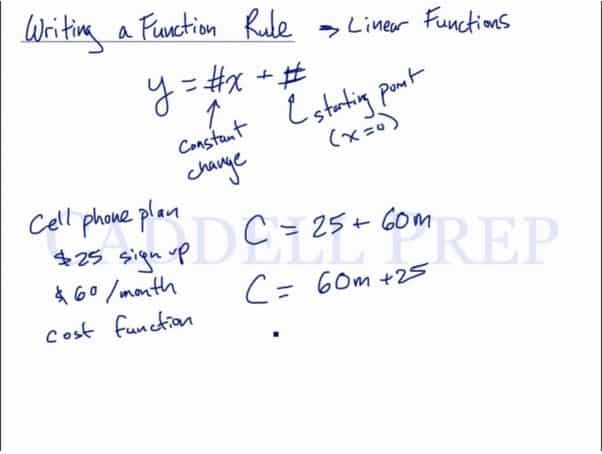 This lesson is how to write a function rule. This video shows how functions typically behave, and how to write them down. Functions usually have a variable with a coefficient in front that represents the rate of change and has a constant value that represents the starting point of the function. We’re going to cover how to write a function rule for particularly linear functions. and is the starting point. The starting point is where . We have a cellphone plan that requests at sign up and requires per month. What is the function of the cost? It will be cost equals start-up fee plus multiplied by the months. This relates very closely with the basic form of linear equation which is . A bank account has in it. Every week, is added to it. Write a function to represent the amount of money (m) in the bank account after (w) weeks. The money will be equal to starting amount plus the amount you add to it times the number of weeks that passed. Now, let’s see how much money you make after weeks. So, we’ll substitute for . which follows the basic linear equation form of .